You probably know how hard it is to get a group of people to all look great in one shot. Well, Photomerge Group Shot in Photoshop Elements lets you take multiple group photos and merge the best of them to get that perfect shot. 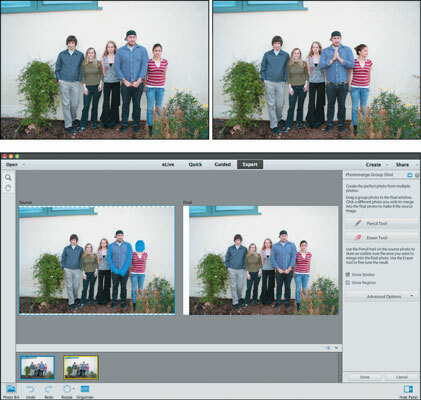 You can access all Photomerge commands in all three Photo Editor modes or in the Organizer. Select two or more photos from your Photo Bin. Choose Enhance→Photomerge→Photomerge Group Shot in any of the edit modes. Take your best overall group shot and drag it from the Photo Bin onto the Final window. Select one of your other photos in the Photo Bin to use as your source image. Drag it to the Source window. With the Pencil tool, draw a line around the portions of the source photo you want to merge into your final photo. You can choose to show your pencil strokes and/or show your regions, which will be highlighted with an overlay. Repeat Steps 4 and 5 with any remaining photos. If your photos aren’t aligned, you can use the Alignment tool under the Advanced Options. With the Alignment tool, click your source image and position the three target markers on three key locations. Do the same on the final image and choose similar locations. Click the Align Photos button. As with Photomerge Panorama, the more alike in framing, size, and so on that your source and final images are, the better the merged result. (Optional) If you see any noticeable seams on your final image around the copied area, click the Pixel Blending button to help smooth over those flaws. If you make a mess of things, click the Reset button. When you’re satisfied with the result, click Done. The file opens as a new file in Elements.